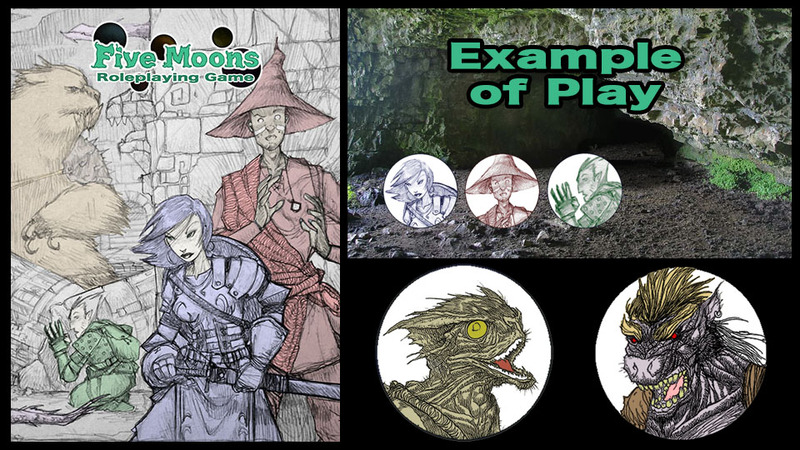 Here is a link to the example-of-play video: a short video demonstrating gameplay in the Five Moons RPG. At the bottom of this post is a transcript of the video. Hello, and welcome to the Five Moons RPG example of play video. I’m Sean K Reynolds, the designer of Five Moons RPG. This is a short demonstration of how characters make skill checks, engage in combat, and spend a character resource called a “boost.” Boosts allow characters to do unusual things with their attacks, skills, and special abilities, and can even be used like “hero points” to bend the rules a bit. Just to make it easier for you to understand what’s happening without having read the rules, I’m using a mix of Five Moons game terminology and third edition terminology. The games play in a very similar way, and if you’re familiar with third edition, you’ll have an easy time learning Five Moons RPG. If you’d like to see preview character sheets for the three player characters in this video, check the video description. The Five Moons RPG blog is also linked in the description, and there’s a lot of information there about the game and the ideas behind why I’m writing it. Akiko the warrior, Octavius the wizard, and Thyrizi the rogue arrive at a roadside inn after dark. They order food in the common room and chat up the other travelers. Octavius tries to talk to a grumpy-looking merchant. The GM has the player try an Influence check, but his bonus is only +0 and he fails to make the merchant more talkative. Octavius has the Friendliness Charm spell ready, but decides to not use it just yet. Akiko decides to talk to a nervous-looking teamster. She draws upon her experiences as a warrior and reassures the teamster that she’ll help keep the inn safe. The GM has the player try an Influence check; Akiko is very personable with a +6 bonus, and she changes the teamster’s attitude from indifferent to friendly. In the conversation that follows, the teamster explains to Akiko that he’s nervous because he decided to make this run without hiring any guards, and then he heard that there have been a lot of orc attacks along this road in the past few days. Akiko consults with her friends about the situation. They agree to accompany the teamster for part of the journey the next morning, and then will head off to investigate the nearby caves the orcs might be living in. The teamster thanks them and offers them each a silver piece for their trouble. Akiko’s player tells the GM she wants to spend a boost to reinforce her earlier Influence roll, in the hopes that he’ll offer them more money. The GM tells her that the teamster doesn’t carry much coin on him because he’s afraid of being robbed by bandits on the road. However, he says that his next destination is the village where he lives, and writes them a note promising them another 5 silver coins each if they ever visit him there. Akiko’s player asks the GM to try a Sense check to see if the teamster is lying. The GM rolls for Akiko, passes the check, and says the teamster appears sincere. The three heroes agree to this deal, retire for the evening, and recover any boosts they spent that day. The next day, the PCs head out with the teamster. When they get to the path that leads to the caves, the teamster pays them and continues down the road. The PCs are walking through a forested area on their way to the caves when the GM decides to spring a goblin ambush on them. The territorial goblins are hiding in the trees, so the GM secretly rolls the goblin Sneak checks opposed by the heroes’ Sense checks. Akiko and Thyrizi spot the goblins, so they get to act in the surprise round. Octavius didn’t spot them, so he’s unaware during the surprise round. Thyrizi is in 20, the goblins are in 15, and Akiko is in 13. Octavius is in 8, but can’t act in the surprise round. Thyrizi has the Improved Initiative feat, which lets him spend a boost to act normally in the surprise round (instead of being limited to just a standard or move action). He spends a boost to activated this ability. He draws his crossbow, loads it, and fires it at the nearest goblin. He hits and rolls 4 damage. He has the Sneak Attack stunt, which adds +5 damage if his opponent is denied its Dex bonus, so that increases his damage to 9, which kills the goblin, which falls out of the tree with a loud crunch. Thyrizi moves himself south to get some cover from a large tree stump. The goblins are next. One throws a javelin at Akiko, but it fails to hit her Armor Class 17. It glides down from the tree, but doesn’t close the distance to Akiko. The other goblin decides it can’t get a good shot against Thyrizi with the stump in the way, and glide-charges to an adjacent square to attack him. With the bonus from charging, it hits his Armor Class 15 and does 2 points of damage to Thyrizi, who is now down to 2 Health. Now it’s Akiko’s turn. She charges the goblin and decides to use Power Attack, which gives her a –5 penalty on her attack roll but adds +5 to her damage roll. Her normal attack bonus with her sword is +7. Adding the +2 bonus from charging and the –5 penalty from Power Attack, her attack bonus is now +4. She hits, rolls 5 damage, plus 1 cold from her Energy Weapons feat, and adds +5 from Power Attack for a total of 11 damage, which kills her opponent. She could have spent a boost on Power Attack to add an additional +5 damage, or to ignore the –5 penalty for this attack, but these are easy opponents and she decided to save her boosts for now. Octavius doesn’t get a turn in the surprise round, so the combat goes to the next round. If Thyrizi doesn’t kill his opponent on his turn, the goblin will probably try to escape, as it’s outnumbered. The heroes have reached the caves and have found signs that orcs are living there. They advance cautiously into the cave and find a 10-foot ladder leading up to an area of higher elevation. Thyrizi climbs up first, followed by Akiko and Octavius. The cave continues on, but before the PCs can go any farther, a group of orcs approaches. Because both groups are carrying torches, they were able to see each other, and neither side is surprised. The GM has everyone roll for initiative. Thyrizi’s initiative is 8 [the video says it’s 7, but with his +7 modifier he can’t roll less than an 8]. His Improved Initiative feat gives him the option to spend a boost to add another +5 to his initiative, but he doesn’t think a 13 is enough to go first, so he doesn’t spend a boost on that. Octavius is in 16, the orcs are in 14, Akiko is in 10, and Thyrizi is in 7. Octavius is first, but the orcs are out of range of his Frost Bolt spell, and he doesn’t want to move into the front of the group, so he delays. The orcs are next. The two in front throw spears at Akiko and Thyrizi. Octavius spends a boost to cast Feather Fall out-of-turn on the flying spear heading toward Thyrizi. Octavius makes a spell attack roll opposed by the orc’s ranged attack roll, and wins, so that attack misses. The other spear hits Akiko for 3 points of damage, so she has 3 Health left. The orcs in the second rank of orcs charge into melee. The first attacks Akiko but misses. The next one attacks Thyrizi, but also misses. The third moves up to Octavius, tries to bull rush him off the ledge, and succeeds. Octavius is knocked back, but his Feather Fall spell automatically slows his fall at the last instant, so the 10-foot fall does no damage to him and he lands on his feet. Octavius decides to stop delaying and take his turn now. He casts Frost Bolt at the orc who pushed him, tries a spell attack roll, and hits. He rolls 7 points of damage. Frost Bolt gives him the option to spend a boost to increase his damage by +3, and because his allies are hurt and outnumbered, he spends a boost on that. The 10 points of damage kill that orc. Akiko attacks the adjacent orc and uses Power Attack, spending a boost to ignore the –5 attack roll penalty. She hits, rolls 7 points of damage, plus 1 cold from her Energy Weapons feat, plus 5 from the Power Attack, for a total of 13 points, which kills the orc. Thyrizi has Instant Stealth, which lets him spend a boost to become invisible for 1 round per level. He does so, and immediately attacks with his iron claw. He hits and rolls 3 points of damage. Because he was invisible when he attacked, he also gets to add his Sneak Attack damage—that’s another +5—for a total of 8. This is not enough to kill that orc. A new round begins. The heroes are in trouble. Octavius has to climb the ladder again. Akiko and Thyrizi are both hurt, and three orcs are still alive. However, each of the PCs still has a few boosts left. For example, Akiko can spend a boost on her Defending Shield ability to increase her AC against one attack by +5, turning a hit into a miss if the opponent’s attack roll can’t hit her boosted AC. The PCs probably can survive this if they’re careful and play smart. This concludes our example scenarios for Five Moons RPG. I hope this got your attention and made you want to take a look at the Five Moons RPG kickstarter, which ends on October 28th. Thank you, and good gaming! Skills: Infl +5 (+5 base), Manip +10 (+5 base, +error?, +5 misc), Move+10 (+5 base, +5 misc), Sense +10 (+5 base, +5 misc), Sneak +13 (+5 base, +3 stat, +5 misc). Skills: Infl +10 (+10 base), Manip +15 (+10 base, +error?, +5 misc), Move+15 (+10 base, +5 misc), Sense +15 (+10 base, +5 misc), Sneak +19 (+10 base, +4 stat, +5 misc). Sure, why not, with his currently limited capabilities, “could” he take the Stone Giant? He hits em on a 6+, Giant hits him 55% of the time (assuming his AC is 25 now from armor/Dex adjustment), dealing 21, easily little more than 1/3rd his HP. While Rogue can deal at least 11 damage a round, and Boost to be invisible to Sneak Attack every time (if he’s lucky, he can boost for another +5). Over the course of 5 rounds, he’d do 55 to the giant, but likely be out of boosts, and would need around 7 more rounds to take him out, which even then, he’d be easily dead by then, as around 3-4 rounds the Giant will have squished him good. Though yeah, terrible test against a monsters numbers in flux, vs. an underpowered, underequipped Rogue in every fashion of the sense. Skills: Infl +15 (+15 base), Manip +20 (+15 base, +error?, +5 misc), Move+20 (+15 base, +5 misc), Sense +20 (+15 base, +5 misc), Sneak +25 (+15 base, +5 stat, +5 misc). Skills: Infl +20 (+20 base), Manip +25 (+20 base, +error?, +5 misc), Move+25 (+20 base, +5 misc), Sense +25 (+20 base, +5 misc), Sneak +31 (+20 base, +6 stat, +5 misc). Skills: Infl +25 (+25 base), Manip +30 (+25 base, +error?, +5 misc), Move+30 (+25 base, +5 misc), Sense +30 (+25 base, +5 misc), Sneak +37 (+25 base, +7 stat, +5 misc). So there’s the end to that trilogy! I admit, my Warrior was probably my favorite, especially in terms of quality (albeit fair few things were assumption based). I think I still intend to do these once I have ALL the information, to see how basic characters hold up, or whatever purposes there would be. Lastly, I really do wanna put him up to the stone giant, but really just sounds like he’d get squished (dealing 11% of his HP, while Giant does 1/3 of his easily, albeit likely at 50% chance). I thought it was interesting that you sorta took into one KS poster assumptions about how enemies would have to do super small damage to avoid Rocket Tag. In this case, the Goblin minions dealing 2 damage, and the Orcs dealing 3-4? (and they also have 10HP). Speaking of HP, I saw on Kickstarter you intend to up it across the board, any thoughts to what that’ll be? Since its clear you currently have a 3/4/5 HP paradigm, do you intend to increase it overall (to like a 5/6/7 or even 6/8/10!) or just make 1st level come with a higher value of HP? (like take the HP and add +10, or double the starting value). Or whatever the implementation. I think I would’ve liked to see other obstacles as well, I think you said ways back this video would’ve included other obstacles in the party’s path, and how they might overcome it (given, in your RPG net chat, you said via Boost-fiat how vs. a Pit). Though I can understand when actually getting down to doing the video, some stuff may not be as interesting to showcase, or just tiring to work on and wanna get it done. Anyway, I was wondering if you would be willing to show what Improved Initiative & Sneak attack all do? Since you’ve basically showed what all the powers do in a given Character, I figured I’d ask for the Rogue as well. Also, I’m curious as to why you chose +3 damage for the Ice Bolt power. For the video it works to match the Orcs 10HP perfectly, but wasn’t sure if some other justification to not simply making it +5, as you have tended to do w/powers so far? I can see you have combat modifiers from 3.5, I am concerned that Surprise Round might be the mess as it was in 3rd (as Written anyway, ye could easily have a monkey in a barrel type scenario always allowing you in on the Surprise round). While maybe those modifiers added to the tactics of the combat system, I believe they were one of D&D’s issues of too many random factors to account for? Lastly, I’m curious if you’ll be returning with the Prone condition giving bonus vs. Ranged? Prone having melee/dodging penalties can seem odd to me, as I’ve always seen in movies how the action heroes aren’t all the penalized for being prone, and totally dodge just fine usually (if not getting up as effortlessly, but all the same). I too would like some elaboration on the strange health and damage ratios between monster race NPCs and player characters. It seems like the NPCs have twice the HP and half the damage. Is there a reason for this, aside from making it very awkward and suddenly lethal when a PC betrays the party for some reason or other (RPGs are a funny sort of game), or the DM wants to build an opponent using the PC creation rules? Yep it was pretty brutal. The PCs were in over their heads. The orcs were basically 3E 1st-level warriors, so they had 10 hp. And with 5 orcs, in PF terms that’s a CR 4 encounter, and the PCs were Five Moons level 1 (which is about PF level .5). I will probably want to adjust Health up a little more for the playtest, as I don’t want this to be a return to 1E’s so-easy-to-die syndrome. However, as I was in the middle of posting these three characters, I didn’t want to (1) increase the health of the later ones because that would make the rogue and wizard have more health than the already-posted warrior. I also felt it would (2) cause more confusion if I went back and altered the already-posted warrior character sheet without an explanation. So, instead, I finished out the process (of posting all three) using the low Health numbers. Now that they’re all out, I can mention in an update and the blog how I’m going to increase Health across the board. Monsters use different rules than PC’s as I recall, though the idea of adding powers to them from other classes was implied to be supported, so I can agree there would be immediate issues if scale to PC & Monsters were tight (Power attack to an accurate monster would be bad at low levels). Lastly, SKR apparently intends to increase the (low-level?) HP across the board for all the PC’s in his next (blog?) update.